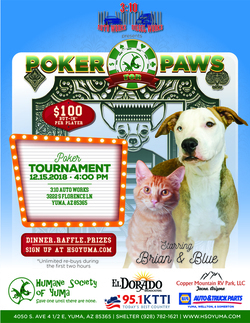 One of the most important and generous ways you can help Yuma's homeless pets is through planned giving. We have created the Legacy Circle in order to recognize those thoughtful persons who ensure the future of our organization...and assist thousands of animals in need. Naming us as a beneficiary in a will or living trust. Making a gift of cash or appreciated securities to establish a charitable gift annuity. Creating a charitable remainder trust. Naming us as the beneficiary of a life insurance policy or retirement account. Naming HSOY as a beneficiary of real estate in a beneficiary/transfer on death deed. We hope you will consider adding your name to our Legacy Circle. As a legacy donor, you will be listed on our website and in upcoming issues of our Paw Prints newsletter (unless you wish to remain anonymous). To include us in your will or estate plan, you must specify our legal name, street address, and federal tax identification number. Perhaps you have already included us in your will, living, or charitable remainder trust? Please let us know. We'd love to acknowledge your support and dedication! Due to life's uncertainities, planning ahead is critical to ensure that your pet will continue to receive th eneeded care he/she deserves. Although it is not a easy topic, there is always the chance that our pets will outlive us. Who will care for your pet once you are gone? 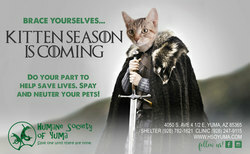 The Humane Society of Yuma can provide information on how we can help care for your pet after you pass. Give yourself the peace of mind knowing that your pet will be loved and cared for no matter what. 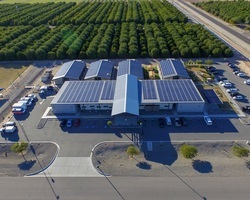 For more information, please email at lshapiro@hsoyuma.com or call at (928) 782-1621 ext. 105. The HSOY thanks all of its Legacy Circle members. These individuals have have remembered the Humane Society of Yuma in their estate planning and are thereby ensuring the future of our organization. To learn more about the Legacy Circle, please contact the Director of Development. 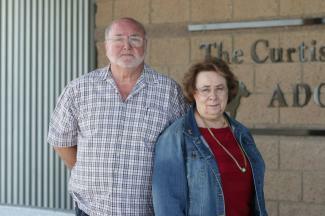 William and Kathleen Baumbeck, Legacy Circle Members. Having lived in Yuma for over forty years we have been personally impacted by the number of stray dogs and cats within Yuma County. Over those years we have taken in more than twelve animals (dogs & cats) and each became a member of our family. 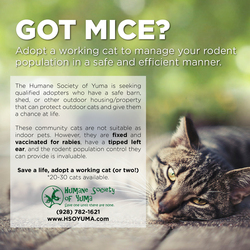 How did you get involved with the Humane Society of Yuma? There have been a few instances when we couldn’t take care of a stray that found its way to our home (example: large dogs). In that case we would feed & water the animal and later take it to HSOY. What motivates you to give to the Humane Society of Yuma? We do not donate to any charity or organizations that we don’t agree with their cause. We also don’t support any charity or organization that doesn’t use donations in a responsible manner. One visit to HSOY demonstrates their commitment to animal welfare. Why should other people care about the homeless pets of Yuma? HSOY, along with the City of Yuma and Yuma County’s Animal Control departments, are constantly engaged in controlling the homeless animals that run throughout Yuma County. Loose animals can cause physical damage to humans and personal property. Loose animals can also transmit diseases that can harm domestic animals. People should get involved with reducing the amount of stray animals by reporting them to the appropriate City or County department.